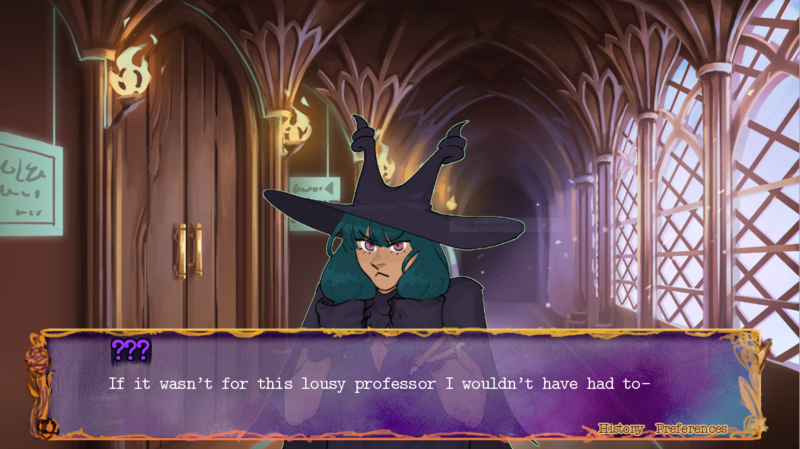 You take on the role of a student investigator who must take a remedial test in order to graduate from the highly regarded Spooxford University, a center of learning for all manner of magically inclined beings. Made during the Search for the Truth Jam. Some elements of this game are still unfinished. Please keep that in mind while playing and thanks for checking it out! 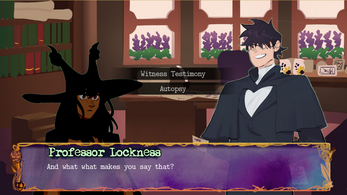 There is no penalty system, so feel free to try out all choices during the presentation phase to see all the dialogue. This is a really cute game! I feel like the relationship between Froyo and Pichu moved a bit fast, but I still loved it! Such a pretty game! I'd complain about placeholders but even those felt less weird to me than anything. Thanks a lot for the kind words! We're aiming to improving the pacing of their relationship. There are 4 endings to the game. Three of the endings end in a Game Over screen. The best ending can be achieved by telling Froyo about the mosquito needle during the third case in the classroom. The endings too, are a bit rushed so we're aiming on fleshing them out in the future. We're really glad you enjoyed the game! - Great art! It's all very dynamic and visually interesting, it really adds to the exaggerated atmosphere. It helps the humorous but with the possibility of seriousness get through. - Soundtracks p good too. Nice choices. - I like the setting. After PLvAA, I've always been hankering for more of a murder mystery/fantasy mash-up, and this doesn't disappoint. - The characters are all very lively, and I felt attached to them by the end. With the exception of maybe David, but I get the impression he's supposed to feel distant. Froyo's a fave. - Along with that, all the character designs are appealing and interesting. - The backgrounds, for the most part, are very nice! - After the first investigation starts, it does start to feel very obviously rushed. I think this is a by-product of your structure. 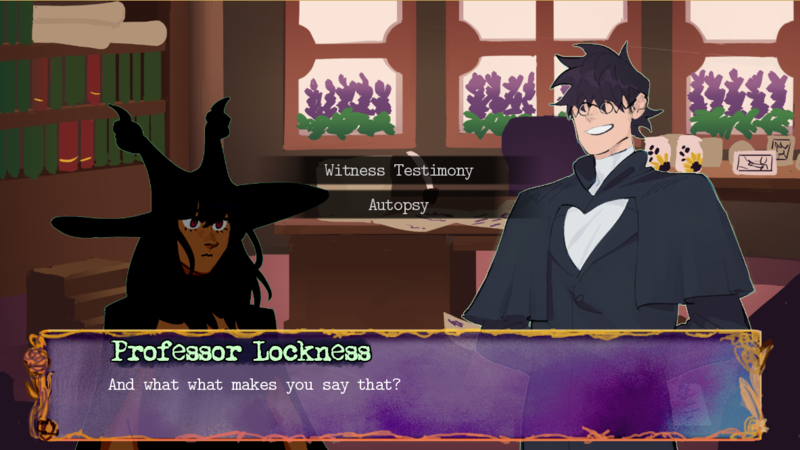 Rapid-fire mystery solving sounds neat on paper, but it also misses what makes cases so satisfying, that they're sort of long journeys towards a solution with many twists and turns. I think, if you ever update this, I'd say choose one of your mysteries, and expand upon it and just make one longer investigation, and integrate the character interactions more into that. - The third investigation was a bit painful. I understand the need to just get something out, but I was seriously straining my eyes looking for something I may have missed. Plus some graphical glitches (the image shifted each time I clicked on something) heavily took me out of it, which is especially problematic considering the image used is a still from Harry Potter, which is already fairly jarring, considering the backgrounds before it. - The character development with Froyo and Pichu does feel a little phoned in and jarring. I like them being on more friendly terms, but Froyo lets her guard down a little too easy for my taste, especially after they spent most of the game berating each other. - This one is a bit more personal preference, but I'd suggest having a penalty system should you decide to expand on this more. Being able to brute-force solutions does take out a lot of the satisfaction of solving a mystery. - I think Froyo and Pichu could do with being a tad bit taller, because you can't really see their character art underneath the textboxes. Which is sad, because it is really good art! - I giggled, but the Alexa jokes should probably be a bit less specific. Referencing Alexa specifically sort of dates your work, and so does "Dank Memes," which I suppose the latter is the point, but I did have an impulse to roll my eyes when I saw the word "dank." It reminded me of the weird dumb dudebros in my highschool. Very very good, I had a blast playing through it, and I'm really interested in what else you have to offer! I'll post a reply to this later on to link you to the posts boosting all the submissions, along with less specific thoughts, later. It makes me very happy to see such high quality work be submitted. Thanks so much for playing our game and for the kind words/indepth feedback! We really appreciate it! We're definitely going to take your feedback into consideration as we continue working on this game. I feel that since we started a bit late on production many parts were lacking but we do plan on continuing to spruce up the game and eventually release a much more polished version. Though that may not be for quite a few months. Also I want to apologize for that placeholder background in the third case. I was not aware just how bad it was. We will have a much better background in the future. We also plan to have a penalty system and expand the story. Thanks a lot for helping to organize this game jam and for your support! https://itch.io/jam/search-for-the-truth/topic/269345/the-game-jam-highlights Just wanted to forward this to you! It's a highlight of all the entries. From Itch.io and other spaces. Hey thanks for playing our game and for the kind words!